Driving an F1 car can never be said to be easy. Even more acutely, winning a Formula One Grand Prix can never be said to be easy. But Lewis Hamilton today may have got about as close as you'll ever likely get to either. From the get-go it was a race of one; even as he led into the opening turn Lewis's ultimate victory of the Chinese Grand Prix never looked in any doubt, reliability aside. And Lewis knew as much, admitting afterwards that he 'was racing himself'. Only he could have beaten himself. And he didn't. His only minor foot wrong was running off the track at the end of his first stint when in the outer reaches of his tyre life, but beyond that it's hard to pinpoint reasonably what else could have been asked of him. 'I can't believe how amazing the car is...the results we're getting is a true reflection of all the hard work (of the team)' said a contented Lewis on the podium. While whatever concerns he had in advance about the car's handling from Friday running (though he still topped the times), plus the nagging concern that there was no dry running on Saturday wherein he could test out the overnight changes, melted away in no time. So long as the Mercs kept going it seemed Lewis's only credible threat in theory was once again from his team mate Nico Rosberg, but after turn one - not helped by coming into contact with Valtteri Bottas - he was tucked up in P7 while his stable mate was making good his escape. Nico's progress up the order was a bit laboured too. He didn't make much hay in the first stint (only clearing Nico Hulkenberg), made more in the second stint as he cleared Daniel Ricciardo in the pits then passed Sebastian Vettel and closed on Fernando Alonso. And he indeed sailed past the Ferrari on the back straight early on in the final stint to claim second place. But by this point the haughty Hamilton was over the hills and far away. Rosberg still leads the drivers' table (just), which as much as anything is a reflection of how much the current points system punishes DNFs, and Lewis of course had one of those in the season-opener at Melbourne and Nico was able to clean up. And already it's hard to see how the Mercs can be caught in 2014. They have a big advantage, but what in my view will likely really keep them out of the others' reach is the nature of the advantage - based as it is on long lead-in items such as the engine layout and the packaging around it. Nico however now needs to find something to make a fight of the drivers' title with his team mate; he can't rely on DNFs as a rule. And now, four rounds into the season we have two clear intra-squad wins for Lewis; one close run thing and one inconclusive. All in as things stand, the scales appear tilted Lewis's way. Once again, the Silver Arrows made things rather appear like they were the sole LMP1 entrants with everyone else representing LMP2. And when Fernando Alonso reckoned after qualifying that he could be best in class as it were behind the Mercs over the race, the consensus was that assessment was a little on the, shall we say, optimistic side. But that's precisely what he did, managing to lead the Red Bulls home and occupy the bottom step of the podium. 'It was a good weekend, we did improve the car a little bit after the first three races, so we felt more competitive. And to be here in the podium is a nice surprise finally' said Alonso afterwards. He wasn't quite giving up on the championship either: 'We didn't have the start of the season that we liked but we're still in the fight'. From anyone else that would sound like head in the clouds stuff, but not from Fernando. It seems that a few technical upgrades have helped the Ferrari F14 T, plus the Shanghai track characteristics and temperatures probably suited the machine. 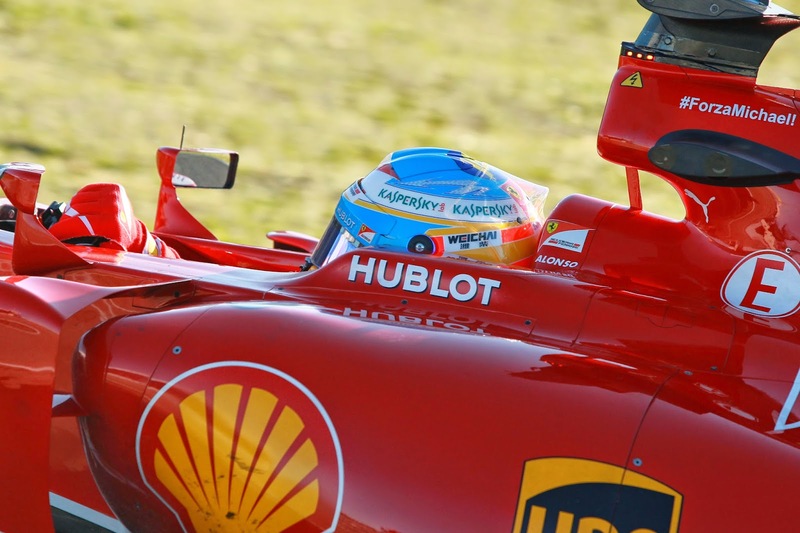 But still, that podium finish seemed almost purely about Fernando. It's just the latest reminder of the magic that he offers behind the wheel, and moreover serves up just about every time. You almost grow bored saying it. A couple of other world champions out there have a bit to ponder however. First off Sebastian Vettel. He seized second place off the line and even though he lost that place to Alonso at the first round of stops, Red Bull falling for what struck me as a rather signposted undercut, Seb still looked on it. His day however unravelled very quickly. He fell back from Alonso in a deliberate attempt to preserve his tyres (as he didn't have the straightline speed to pass). But he fell back rather more than what would have looked strategic, and with the additional tyre wear he was experiencing the Red Bull team was caught rather between two stools of two and three-stopping. When Rosberg moved past Seb disputed the position which - while spirited as well as was entertaining for us watching on - probably was less beneficial to him than simply bowing to the inevitable. And the time lost in the scrap put his more freshly-booted team mate Ricciardo - who'd succeeded in stretching out his first stint - onto his tail. Then came the call; just like in Bahrain Vettel was asked to let Ricciardo past. 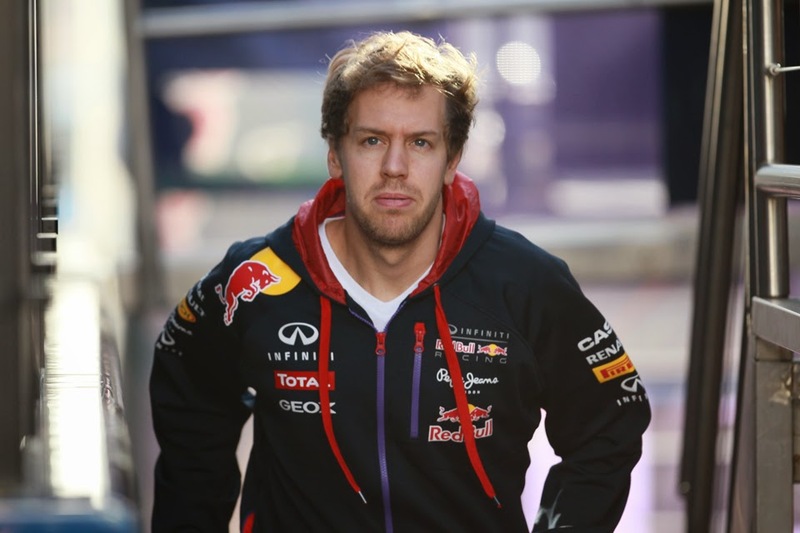 But unlike in Bahrain Seb, having ascertained that unlike then he and Ricciardo were on the same strategy, didn't comply. His response, literally, was 'tough luck'. Ricciardo did pass shortly afterwards, which all concerned including Vettel himself insisted was a deliberate yield, but you would have been forgiven for thinking it appeared that Seb had simply run wide inadvertently, too busy looking in his mirrors when under attack from his stable mate. And from there on Seb rather sank, unhappy on his worn tyres as his pitwall occupants decided on a two-stopper after all, rather to the chagrin of its champion driver. Come the end he trailed Ricciardo home in fifth, some 24 seconds afterwards. Christian Horner admitted afterwards that Vettel's 'not been able to read' this year's variety of Pirellis, and this was an area previously a strength for him. 'I was just too slow' said Seb, brutally. While Kimi Raikkonen was never a factor today in the other Ferrari, finishing eighth and - most traumatically - some 50 seconds plus after his team mate. Yes, he missed FP1 after technical troubles. Yes, reportedly the F14 T isn't handling to his liking. And, oh yeah, Alonso's very good. But you feel that even with these the deficit shouldn't be adding to that much. But in another developing theme for 2014 Daniel Ricciardo impressed us yet again. He lost places off the start, running P4 early on, but as mentioned smartly extended his first stint and then reaped his reward by running on fresher tyres than those around him for the rest of the day. He moved past Vettel as mentioned, and later showed plenty of spirit in hunting down Alonso for the final podium slot. He reckoned with another lap he'd have 'had a sniff', but then again Alonso gave the impression of letting out the rope as far as he dared. For Ricciardo though surely his first (proper) top three finish, and better, only is a matter of time. But as mentioned, Mercedes sweeping the 2014 honours already seems a lot like a matter of time too. 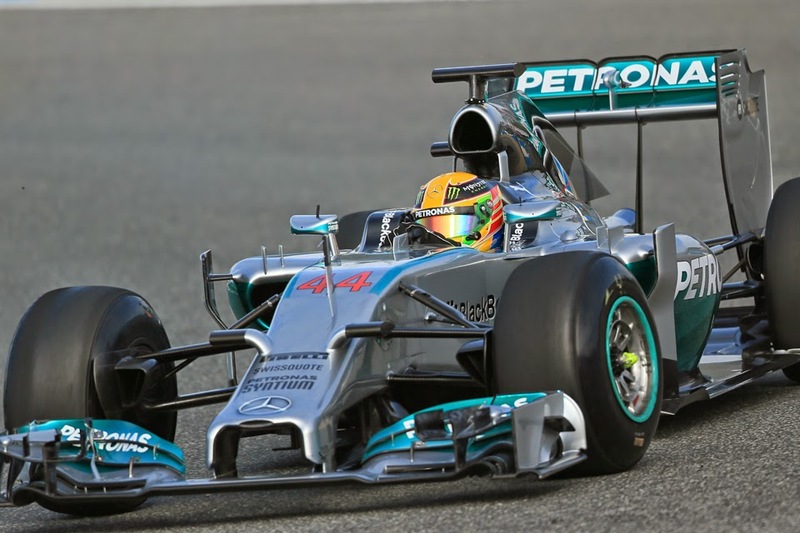 As, increasingly, does Lewis Hamilton capturing firm control of the drivers' title fight.